The home’s stately front entry, festooned for the holidays, welcomed guests as part of the 2017 VNA Holiday House Tour. 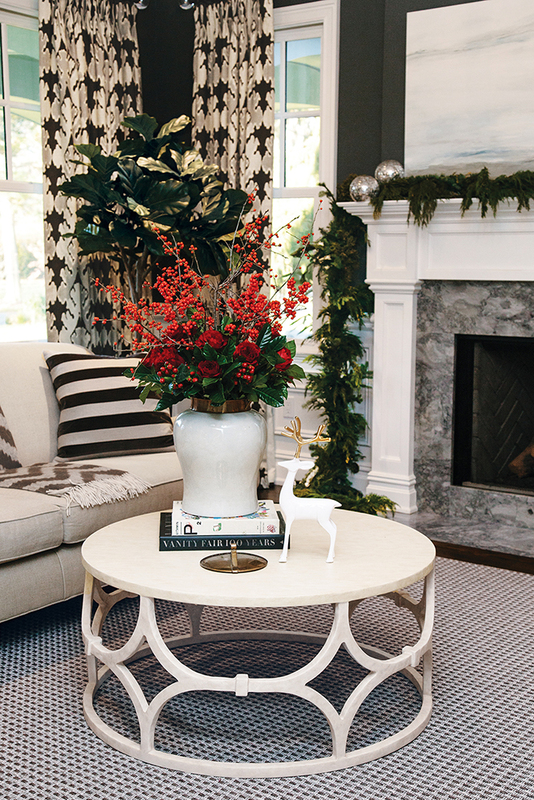 The interiors of this Rumson, New Jersey, home offered an ideal backdrop for Kristi Evans to work her holiday magic. 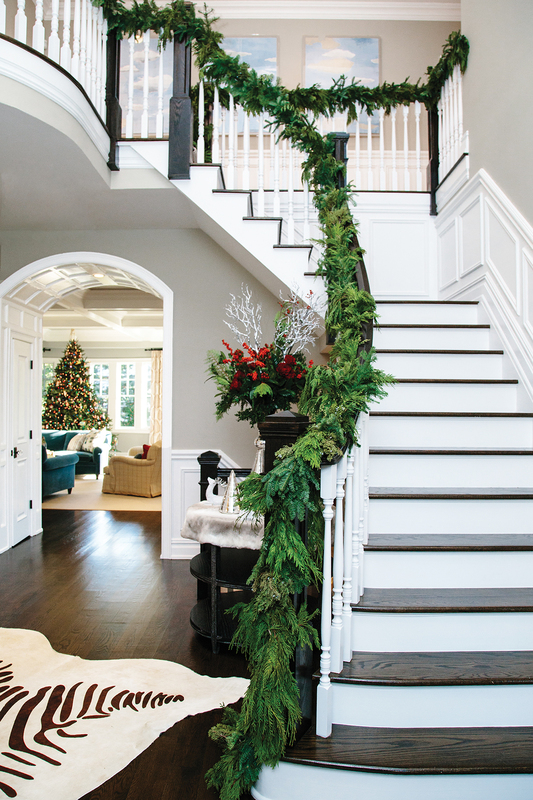 Tour-goers were greeted in the foyer by a garland of cedar, juniper, pine and balsam on the home’s gently curved staircase. The unstructured greenery brought a casual touch to the crisp dark stain/white trim combination in the space. A console under the stairs, adorned with silver and white figurines on a silver tablecloth, added a bit of formal flair. Compact floral arrangements don’t interfere with dinner conversation. Tall tapers add balance without obstruction. 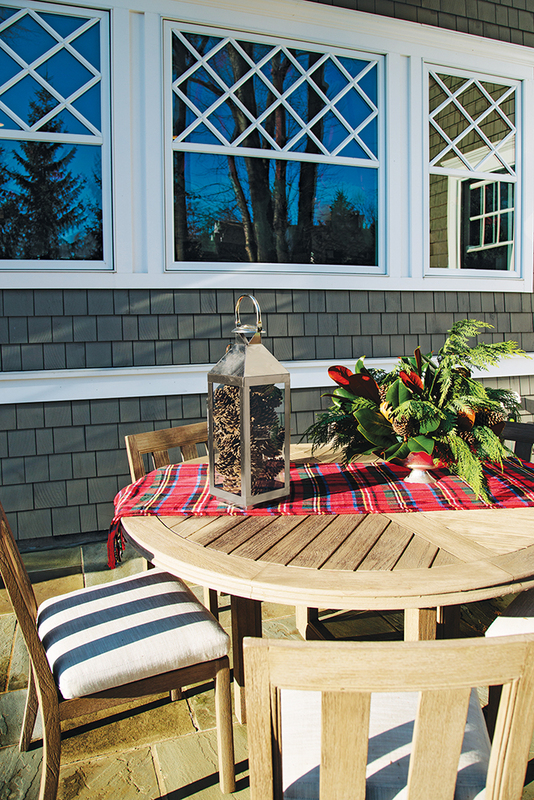 Evans worked with Laurie Caccavo of The China Closet & Home Furnishings in Fair Haven to create this tablescape. “The collaboration created an elegant, yet accessible tabletop design,” she says. 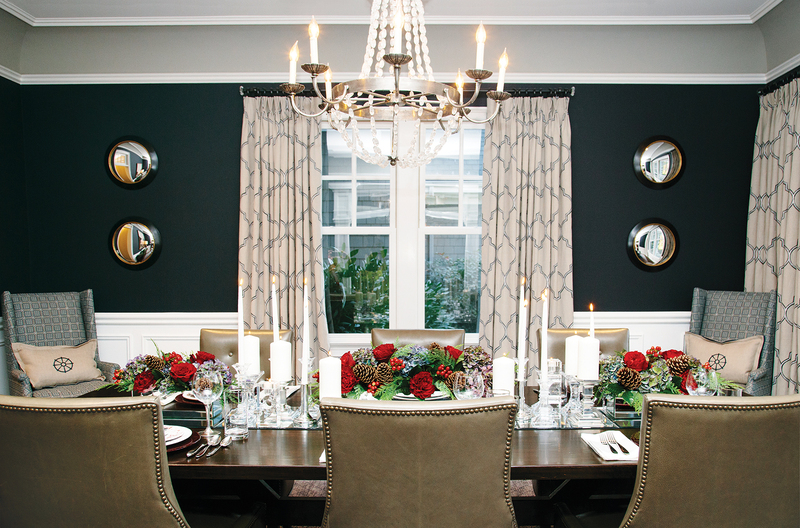 In the dining room, Evans collaborated with Laurie Caccavo of The China Closet & Home Furnishings in Fair Haven to create a feast-worthy table setting. Caccavo added holiday sparkle by pairing crystal stemware with silver and crystal candlesticks. “Down the center of the table, Catherine and I created a ‘runner’ made of mirrors to reflect the glow of the candles and crystal,” Evans says. The pair then used mirrored vessels to hold the arrangements. The three “centerpieces” featured ‘Red Charm’ peonies, heart roses, ilex, gardenia greens, pinecones with mixed holiday greens and Margarita Classic Blue Holland Hydrangea. That particular type of hydrangea “has such beautiful tones of blue, gray, lavender and sage,” Evans says. “It worked perfectly with the coloring in the dining room.” The traditional yet understated tablescape is ideal for the sophisticated space. 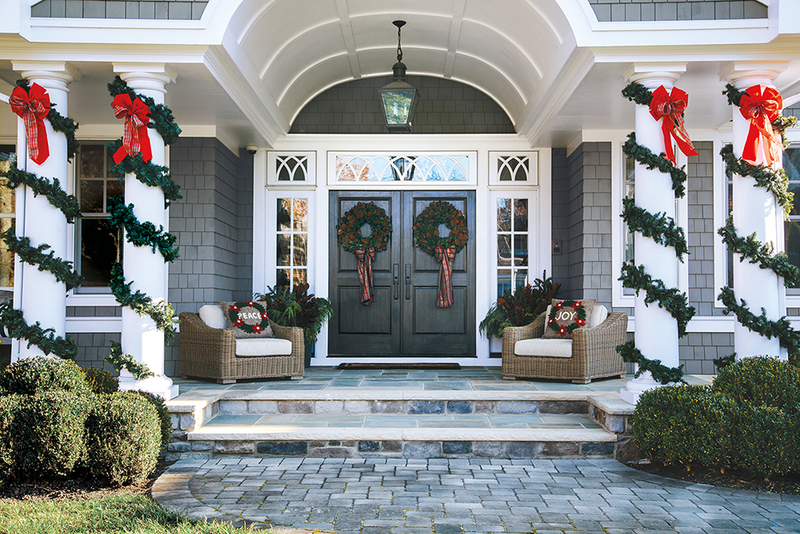 This year’s Visiting Nurse Association Holiday House Tour will be held on December 7. For details, visit our calendar. Kristi Evans now works as a floral designer at Sickles Market in Little Silver, New Jersey. Overall: holiday décor, Kristi Evans of Pink Peony Events in Fair Haven; interior design, Kelli Suozzo of Bowerbird in Rumson (soon to be Red Bank); tableware, The China Closet & Home Furnishings in Fair Haven. Foyer: area rug, Saddlemans in Costa Mesa, California; console next to stairs, Plantation in Los Angeles. Living Room: throw pillow, Ryan Studio in Chantilly, Virginia; window treatment fabric, Kelly Wearstler for Lee Jofa; cocktail table, Mr. Brown London in High Point, North Carolina. Dining Room: chairs at table and in corners, Vanguard Furniture; pillows on corner chairs, Ryan Studio; mirrors on sides of window, Ballard Designs.